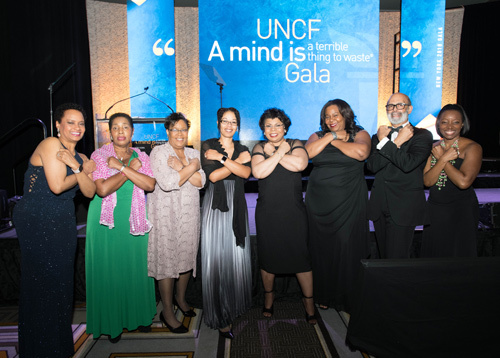 Close to $900,000 was raised at the recent UNCF “A Mind Is…” Gala honoring game-changing HBCU alumnus and White House correspondent April Ryan, Tony Award-winning director Kenny Leon and UNCF campaign contributor Oracle Corporation. More than 900 business, civic and education leaders attending the March 8 event. UNCF member-institution presidents, along with UNCF president and CEO Dr. Michael L. Lomax also attended. HBCU alum (Howard University) and “Entertainment Tonight” correspondent, A.J. Calloway served as master of ceremonies. The 2018 UNCF “A Mind Is…” Gala continued its tradition of honoring trailblazers for their game-changing education advocacy through partnerships with UNCF and through their own work. This year’s honorees, who through their sacrifices and determination, have led the charge in championing for a quality education for all, include White House correspondent April Ryan, who received the Shirley Chisholm Award for community service. Both Kenny Leon and the Oracle Corporation accepted the UNCF President’s Award. colleges and universities that contribute to the regions and communities HBCUS have served for more than 100 years. And in the recent landmark study, HBCUs Make America Strong: The Positive Economic Impact of Historically Black Colleges and Universities--commissioned by UNCF’s Frederick D. Patterson Research Institute--UNCF shows the nation’s HBCUs generate $1.8 billion in economic impact annually; equivalent to a ranking in the top 200 on the Fortune 500 list of America’s largest corporations. These institutions generate more than134,000 jobs for their local and regional economies—equal to the number of jobs provided by president’s awardee Oracle, one of the nation’s largest private employers.